Off and on the bike sometimes would not start, no clicking, nothing. At times the starter would keep running with key off. Now it fails to start. I replaced A and B relays, checked and cleaned starter/reverse switch. Still will not start. I supplied 12volts directly to the red terminal relays' coil and it starts right up. Where should I look next? All fuses check okay. Any help would be appreciated. Make, model, and years is always helpful. That info is in my avatar below pic. Thanks for responding. 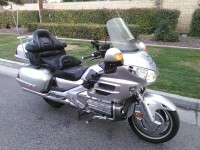 03 1800 Honda Goldwing. Explain exactly what you do too have the starter motor going with the key off. Did this all start after or sometime after doing maintenance or adding an accessory? Some people read this on their phones and do not see the avatars. While others will not assume what's in the avatar is the one he's working on.